So, have you given up on the whole "swing movement" already? I can see it happening, I mean it was beaten to death in much the same way ska was a few years ago. Chances are that it will die without some kind of act to revive it - you know, rekindle the fire with a sound unlike all the rest. This singer / songwriter will be releasing his debut album in the states this February with Roadrunner Records. With the release of this album, the world will be introduced to a new style of swing - the total retro style. This is not the neo-swing we get from the likes of Cherry Poppin' Daddies or Big Bad Voodoo Daddy, no sirree. This is cabaret-influenced jump blues. The music on the album strays from the power dance jive we have been getting hit with, and goes deeper into the strain. The obvious Southern influences are there, and when coupled with the smoky jazz feel we are given the sound to revive the revival. Jake does not believe in Rock 'n' Roll. The focus for him is a total bond with the music. Everything is soulful, there is no put-on face or angst and depression he is bouting. In fact, he has a song entitled "Let's Kill all the Rock Stars" which he claims to be dedicated to Marilyn Manson and those like him. Jake's sound is sure to be enjoyed by most everyone. I have played it for everyone from High Schoolers to Grandparents, with no complaints from anyone. Sure, not everyone hopped out of their seat and asked "Who is this? I want it!" The thing I did find odd is that some people did. I had never seen that before. Just the fact that people I know are awaiting its release screams the quality of this album. "Dinner with the Devil" definitely borrows from the styles of Rockabilly and "Let's Kill all the Rock Stars" is a punk-swing combo that redefines the limits of swing & jazz. The true shining jem of this album is the lyrics and vocals. It is deeply rooted in politics and the realities of life. Songs like "Mercy for the Monkey Man" speak of the fears Jake has for society and himself - that we do not become trapped by our desires. 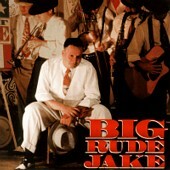 In "Dinner with the Devil" Jake starts out with a vocal style straight from the 30s and goes into a power-driven style filled with an angry tone perfect for the song. Everything speaks to the listener - no one is alienated by these lyrics because he is the everyman. Included on the album are two spoken word pieces - which I amazingly enjoyed. Spoken word usually never grabs me, but the smoky jazz-lounge style in which they are done, along with the captivating voice of Jake drew me in. Nothing on this album can really be called my favorite. I guess in that way I am much like Jake, who recently stated in our interview with him that his favorite changes almost daily. Every song shines, but I must make one thing clear. Jake is not your happy-go-lucky music. He tackles life and does it tactfully and tastefully. His character is one of true professionality with a bottle of genius and a shot of sarcasm.